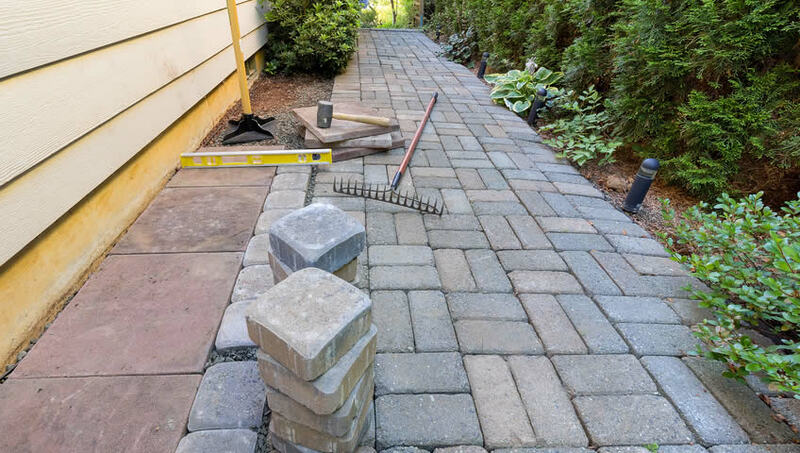 If you’re thinking about adding pavers around your home, whether in the backyard, front or side, it’s important to understand the differences in pavers that are available to select from. Pavers are mainly broken down into two categories – concrete pavers and brick pavers. Both offer great solutions to add to the beauty and functionality of your outside space, but there are some major differences between them that you should be aware of. Concrete pavers are available in a variety of sizes and shapes, including smaller 4” x 8” and 6” x 6” sizes, and up to 24” slabs. These pavers are available in irregular and plank shapes. Brick pavers, made of clay, typically only come in a 4” x 8” size. Brick pavers also have very similar faces, while concrete pavers are available in a vast selection of finishes, including smooth finishes, cobbled styles, natural stone textures, antique tumbled finishes and more. Concrete pavers also can have stylish faces created using special aggregates and tools. Color is also a consideration when trying to decide between concrete pavers and brick pavers. Clay brick pavers are usually available in a somewhat limited number of color blends and shades. On the other hand, concrete pavers have a larger footprint within color tones, shades and what are known as variegated color blends. This offers much more flexibility within the design area, and allows to create more coordinated designs and patterns. Most concrete pavers are resistant to fading. Most pavers are very resilient in general, although brick pavers are more prone to cracking in climates where freezing and thawing occurs. Concrete pavers are better suited to handle all weather conditions. Because of the many differences in pavers, it’s best to contact a professional when it comes time to consider adding them to your home. West Coast Pavers is fully licensed and equipped to offer you a complete range of paving contracting services. And because we have such a wide variety of options, we are confident we can meet your needs and deliver the satisfaction that you expect. We have both the expertise and experience to handle any job. © 2011-2019 West Coast Pavers. All rights reserved.